Ryan’s Hockey Tournament was the very first ‘a Life for a Cure’ event in 2010. It has grown each year with over 250 players taking part in 2016 when we reached an amazing fundraising total of £400,000! The idea, like always, is for a fun hockey tournament for all ages and abilities, a big BBQ, hopefully some sun: a great way to pay tribute to Ryan and support our cause – which essentially is to stop other amazing lives being lost to meningitis. ALL abilities are welcome. Mixed teams of minimum 6 a-side with at least 2 girls or 2 boys. 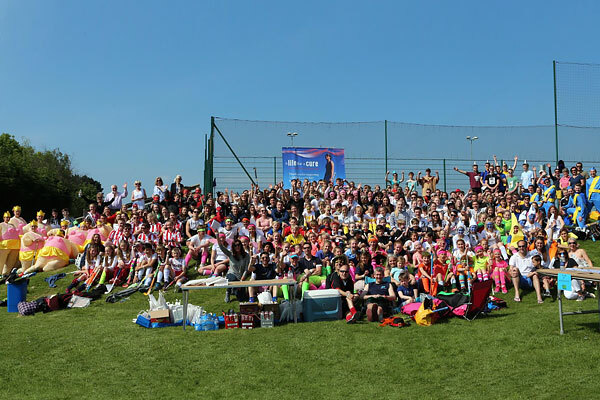 Enter a team as soon as you can – last year we had to turn people away as we had over 30 teams! There will be a prize for the best fancy dress again – this has been brilliant every year and look forward to seeing some of the interesting creations!! The day wouldn’t be possible without some umpires! We would love to hear from you if you could spare an hour or two. The rules are pretty basic and just a decent hockey knowledge is required – and a loud whistle! We will feed and water you and be extremely grateful ….forever! It is everything that Ryan would love – especially the banter! Please take part or if hockey isn’t your thing, we would really appreciate your support at this fantastic family event that is sponsored by Burston Cook. Can’t wait to see you there. It’s going to be great! Fancy Dress an absolute must – there a prizes for the most creative! BBQ, cakes and raffle – because we all love a raffle!! Once you bring your team together, please select a captain. Then e-mail emilyatkinson10@hotmail.com your TEAM DETAILS, your TEAM NAME and a rough idea of your ages!! Please try and email Emily or Michelle at michellebres@btinternet.com with confirmation of a team as soon as possible, even if you don’t know who exactly is in your team, just the team name would be great as it makes organising the day a bit easier!